The long weekend has come. I'm pretty excited about it since the kids are all out of school and on Monday night we'll have a great time enjoying delicious food and drinks with gfamily and friends and then heading to Navy Yard like we do every year to watch the town's Fireworks show. It's always a blast with tons of activities to do, plenty of entertainment and great company. What are your plans for Canada Day?! Like I said above, we get the family together for a barbecue and enjoy lots of food, treats and drinks and then make our way to the park. 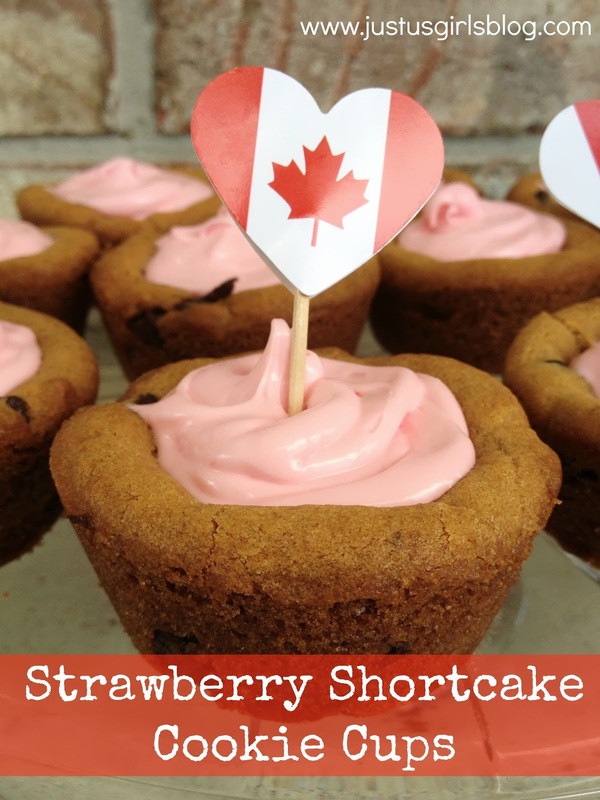 This year I'll be bringing some Cookie Cups filled with a strawberry shortcake delicious filling that was super easy to make and I'm sure will have the kids going cray, cray! Don't they look delicious?! And aren't they pretty with the Canadian Cupcake toppers? These toppers were sent to us from Frost and Fete. They're a Canadian based Etsy shop that create homemade beautiful toppers for all occasions. From Holidays to baby-showers, weddings and even personal customized toppers, these ladies have it all and all at a really affordable. You can use their toppers for just about anything, veggies and fruit, sliders, cheese cubes and so much more. Be sure to check them out! Scoop cookie dough into a greased muffin tin, evenly dividing the dough between all 12 cups. Bake cookie dough at 350 degrees for 12 minutes (or until browned around edges). Remove from oven and allow cookies to sit in pan and firm up for about 3-5 minutes. Run a small knife around the edges of each cup before popping it out and putting it on a plate. Using the end of a wooden spoon, press the center of each cookie in to form a cup. Chill cups until they are no longer warm. Add 1 cup of Cool Whip and mix until smooth and creamy. Place filling in a large zip-top bag and clip a corner. Pipe filling evenly into each cookie cup. Serve immediately or freeze and serve chilled. Disclosure: All opinions are my own. I received cupcake toppers from Frost and Fete at no cost for the purpose of this review. No other compensation was received.